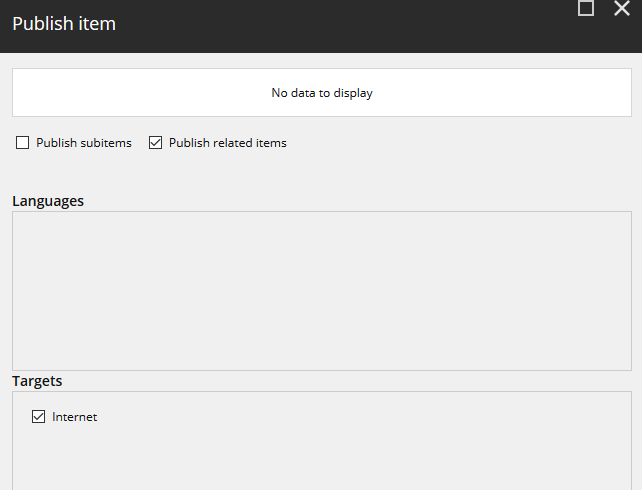 We have setup the Publishing service version 1.1.0 on Sitecore 8.2 initial version. There are no errors in the Sitecore publishing service installation and also during the module installation. The issue is when we try to publish, the publish dialog doesn't display any languages. I have tried the suggestions mentioned in Sitecore Publishing Service does not show the languages and seeing 404 errors but still have the same issue with languages. I do not see any errors in the logs which could indicate an issue during the publish dialog is loaded. Can anyone let me know if you have come across this issue and if this was resolved? Below is a screenshot of the publish dialog and how it looks. I had the same issue, and it was because I turned on the Debug mode in Experience Explorer, and then I just closed the tab without changing back to Edit mode. After I opened Experience Explorer in Edit mode, the list of Languages was visible, and Publishing started working fine for me. Just got resolution for my issue which was quite similar to yours publishing target missing after installing Sitecore publishing module. you can try clearing temporary asp.net files to make sure nothing is cached. Not the answer you're looking for? Browse other questions tagged publishing-service or ask your own question. Where is the schematool command in Sitecore Publishing Service 2.0? Publishing Service, transactions are atomic?